What is the importance of the NEBOSH certification? 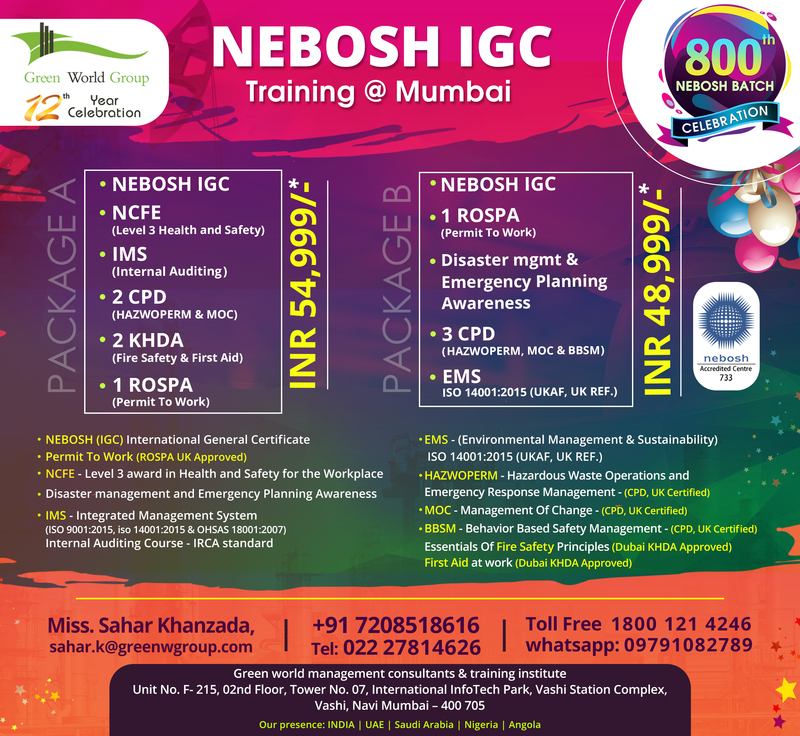 You are here: Home / Nebosh course in mumbai / What is the importance of the NEBOSH certification? NEBOSH Qualifications are most wanted and prestigious one throughout the world. The NEBOSH qualifications are classified into certifications, awards and diploma. Since these certifications are efficiently made to study and fetch the knowledge in health and safety management, risk, hazard auditing, identification of workplace hazard, emergency handling etc. number of passionate job seekers choose this to get place in a good organization. And this certification has no expiry, once if you have done NEBOSH in your lifetime, there is no need to repeat this course again. But NEBOSH do updates its syllabus i.e. revises the syllabus, those updating contents can be known from the official site of Nebosh. Consider an example: if a candidate is completes NEBOSH IGC, he may continue his higher studies in safety field if he wishes. He may do NEBOSH iDip which is Level 6 qualification, whereas NEBOSH IGC is Level 3. How will this NEBOSH certification help my career? NEBOSH Qualifications has become one of the essential qualifications to get a job in the field of safety, in any industries of all sectors. Absolutely the NEBOSH qualifications helps, the people who want to make their platform in the field of health and safety. The NEBOSH qualification in your resume adds a highlight to your profile. All the employers around the world hire the candidates who completes NEBOSH course for the job post like safety officer, safety auditor, safety engineer etc. to maintain peaceful and safety culture. There are number of job opportunities in Middle East, India and throughout the world. There are many benefits, once you finish up NEBOSH course, you may get hired in a reputed organization with good salary package and there exists a good name and fame among the colleagues in the organization. Usually the HSE professionals are treated with good manner because they look after the important part of the organization, the health and safety management part. The NEBOSH completed person will have depth knowledge in health and safety, as they were tested with the practical knowledge of risk and hazard issue management, as the exam pattern contains a practical risk assessment in which the candidate prepares a report on basis of real time scenario. Once if you get placed in any organization as safety officer or engineer, after some years of experience you may become the safety manager in the organization.